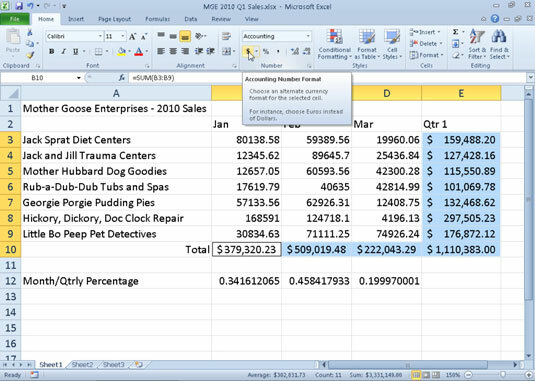 Many Excel 2010 worksheets include financial data, so you’ll likely use either the Currency or Accounting number format when working with this data. You can easily assign these formats to selected cells by choosing Currency or Accounting from the Number Format drop-down list in the Number group on the Home tab. Use the Format Cells dialog box to specify other related options. Use the Accounting Number Format button in the Number group to quickly format selected cells in that format. Click the Accounting Number Format drop-down button to display a menu of other major currency number formats from which to choose. From the Home tab, click the Number dialog box launcher in the bottom-right corner of the Number group. In the Category list, select Currency or Accounting. Currency format: Displays the currency symbol immediately to the left of the number and gives you a choice of how to display negative numbers. 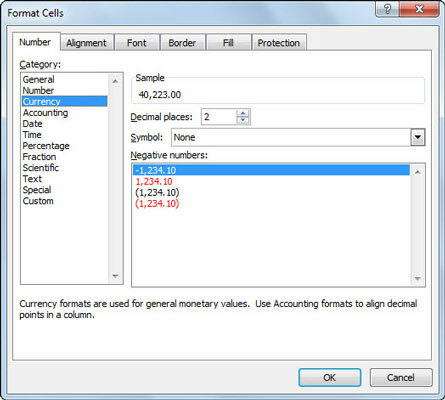 Accounting format: Displays the currency symbol at the left edge of the cell, lines up the decimal points in a column, and encloses negative values within parentheses (the way accountants like them). Also indents numbers slightly from the right edge of the cell to accommodate the right parenthesis in negative values. Use the Format Cells dialog box to apply Currency and Accounting formats. Change any other options as desired, such as the number of decimal places or the symbol to use for currency. The Currency format also enables you to choose different ways to display negative values. Use the Accounting Number Format button on the Home tab to quickly apply the Accounting format to worksheet totals.